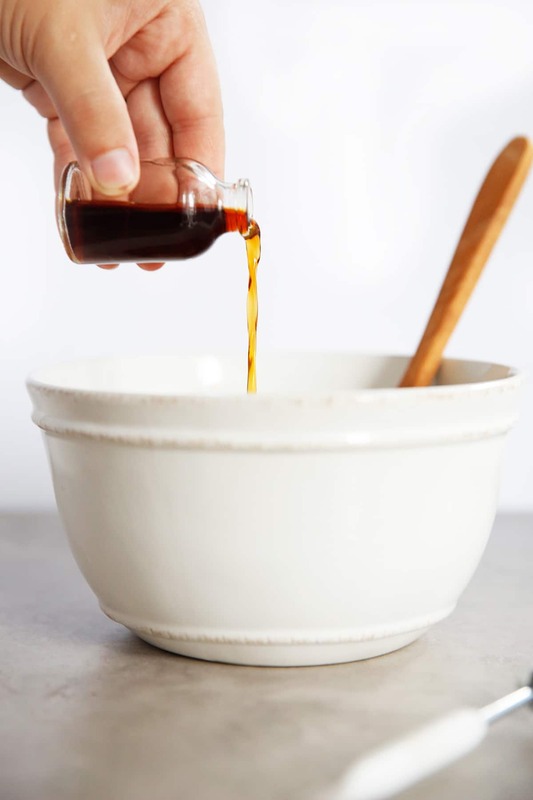 Homemade Vanilla Extract requires only two ingredients, and we’re going through the step-by-step process of how to make it. It’s better quality than anything you can buy at the store, for less money and it makes a great gift! Here at LCK, we treat vanilla extract like liquid gold. We love using it in all of our baked goods like muffins, cookies and cakes. 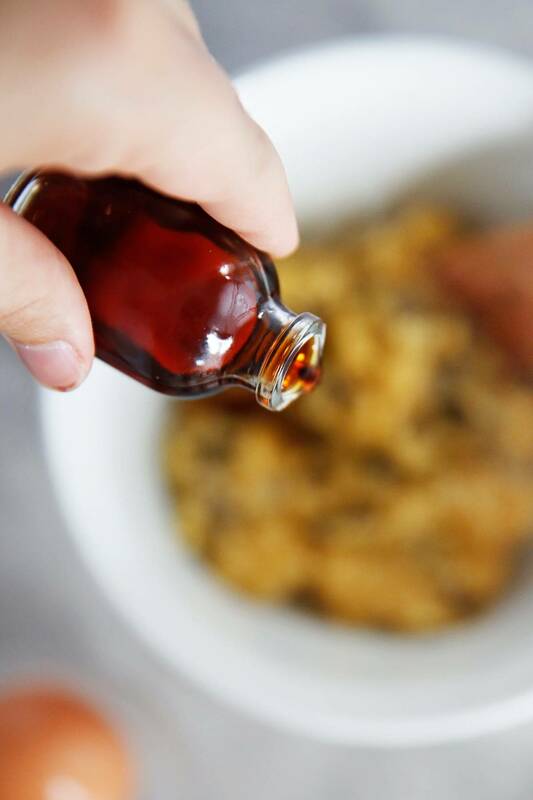 A good vanilla extract can make a big difference in a recipe, especially ones that only have a few ingredients in it. 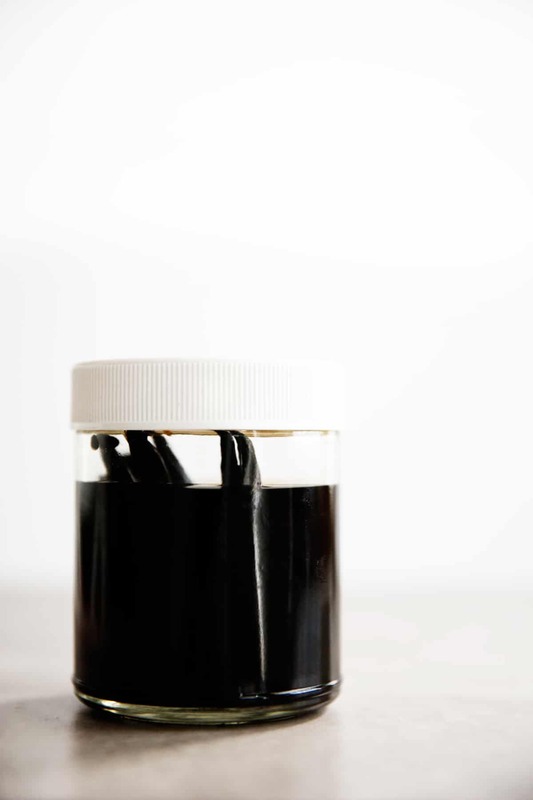 The price of vanilla beans fluctuate from year to year, and currently they are trending to be very expensive causing the cost of store-bought vanilla extract to rise. In addition to this, there are often quite a few added ingredients besides vanilla bean in the extract that are questionable. All this being said, it makes total sense to make it at home because Homemade Vanilla Extract is SO EASY to make. All you need are two ingredients (vanilla beans and vodka) and about 10 minutes of time to put together a batch! We’ve included instructions to make a one cup batch, but this is something that is so easy to double or triple to make a great big batch to last a while, or to give out as gifts during the holidays. 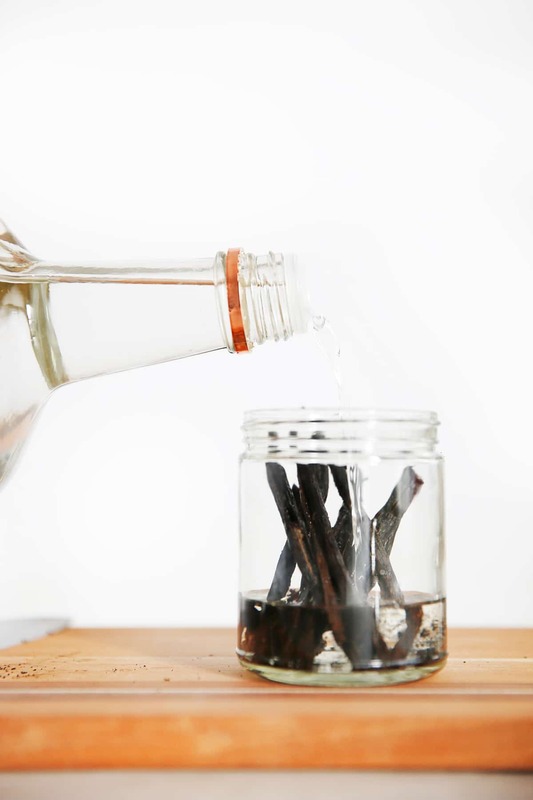 How Do You Make Homemade Vanilla Extract? It is so simple! All you need to do is scrape out the beans from 5 vanilla pods (beans) and cut the pods to fit the size of your jar. It is best to use grade B vanilla beans which are better for making extract because they are drier than grade A, which are better for baking with. Place the scraped beans and the cut pods inside of a clean jar and top with 1 cup of alcohol and close with a tight-fitting lid. Scraping the beans leaves the extract with flecks, which we think makes it more authentic, but you can also skip this step and just slice open the beans and place in the jar, or strain it if you don’t want any flecks. What Kind of Alcohol is Used To Make Vanilla Extract? Any neutral tasting alcohol like vodka is a good choice, but really any 80 proof alcohol like brandy, rum or bourbon is fine so long as you are okay with it imparting a slight flavor. We like to use a gluten-free vodka, like Tito’s. How Long Does Homemade Vanilla Extract Last? 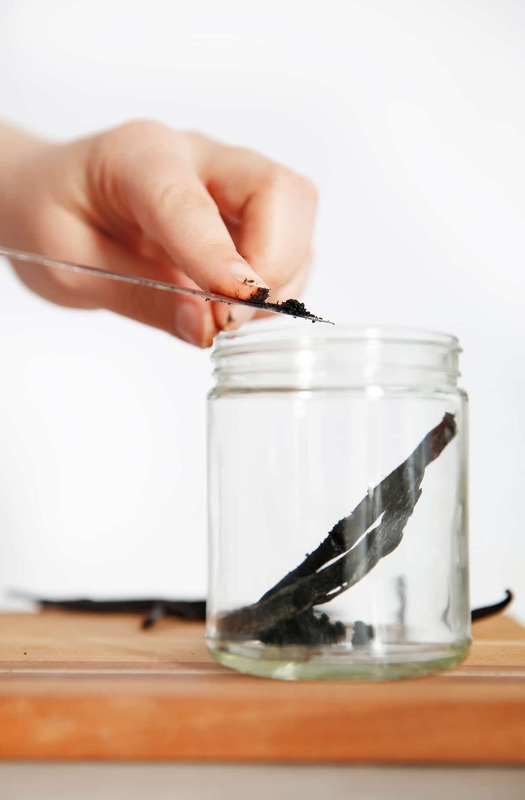 The jar sits at room temperature and is ready to use at 6 weeks, though it is best to leave it as long as possible. We’ve tasted it at 6 weeks, when it is similar to store-bought extract, and then at 6 months where it is pretty phenomenal and after a year, it is truly the most amazing extract you have ever smelled. Pure extracted vanilla in alcohol has an indefinite shelf life. If you make more than one jar at a time you can make sure you never run out. When one jar starts to get low, place in a few more scraped vanilla beans and top it off with some vodka and set it aside while you start on your second jar. BONUS: You can also give these out as gifts by purchasing some small jars and putting on a cute label and with some ribbon. P.S. We buy our grade b vanilla beans here. 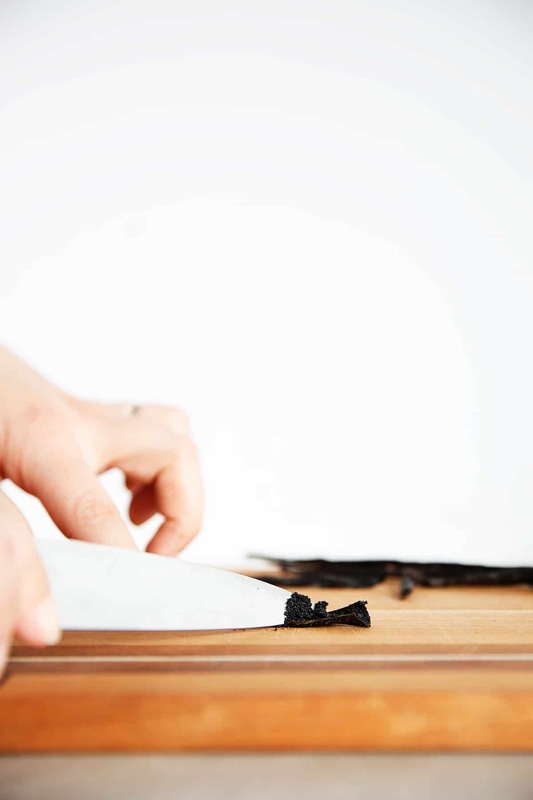 Using a sharp pairing knife, slice vanilla beans in half. Scrape out beans using the back of the knife and place inside of a clean 8 ounce jar. Continue with the remaining vanilla beans. Once they have all been scraped, cut beans in half or to fit jar. Place cut beans inside the jar and pour in 1 cup of vodka and cover with a tight fitting lid. Let sit at room temperature for at least 6 weeks before use. The longer you let it sit, the more flavor it has. We love to have the flecks of the vanilla beans in the extract, but if you'd like to have a clearer extract you can save the beans for another use, or strain the extract before use. To make more extract at once, double or triple the recipe. LOVE the idea of gifting this! Where do you get your vanilla beans? I just saw the link. Maybe I should ask which ones do you purchase? Which vanilla beans you get? love this! thinking of making in bulk as holiday gifts. where do you suggest getting the jars? Amazon, or a store like Michaels! The link doesn’t link a specific brand or bean, so that’s why people keep asking, I think. Maybe a dumb question, but assuming this iremains alcoholic and can’t be put in something that isn’t cooked…like yogurt? That is correct, as the alcohol burns off when heated. 2. Almost all extract, whether purchased or not has alcohol in it unless you specifically buy a brand that says alcohol free. If you are avoiding alcohol all together than this might not be for you, but we use this in any recipe, whether cooked or not because it is such a small amount–even yogurt.